Barricades are referred to as any structure that safely obstruct the passage across a route. We make sure that our assortment of Barricade is manufactured from the certified quality of raw materials. Latest techniques are implemented while manufacturing these Barricades so that our clients get the advanced range. 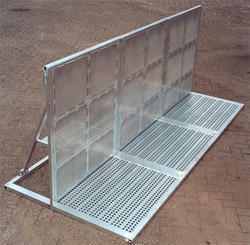 Based on the requirements of our clients, we also configure these Barricades. As compared to other ordinary Barricades, our range is clearly visible from long distance and demand less maintenance.